Beatbox Entertainments teenage discos is perfect for birthdays, general occasions, and other events. With LED Lighting and Lasers, you will be impressed with our cool disco show. Your DJ will play all the latest music from the top 40 and you can create a playlist of music you would like to be played as well (please do this at least 1 week before party). Our mobile discos are tailed to your needs, so get in contact with us today for a quotation! Upgrade your party to a UV glow teenage party! This disco packages includes glow sticks to create a cool effect in the dark. This package is very popular amongst our teenage customers, we can also give everyone a glow stick on request. Looking for something even more special? Upgrade to a VIP party for a red-carpet, pop-corn and candy floss. Click here to take a look. 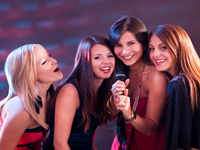 We can also provide Karaoke alongside a teenage disco, our new digital karaoke system is perfect for your event. We have all the latest charts included on karaoke.